For the 11th consecutive year, Samford University is a corporate sponsor for the Birmingham Habitat for Humanity project Home for the Holidays. The initiative, in collaboration with Birmingham’s ABC television affiliate, provides a needy family with a home during the Christmas season. 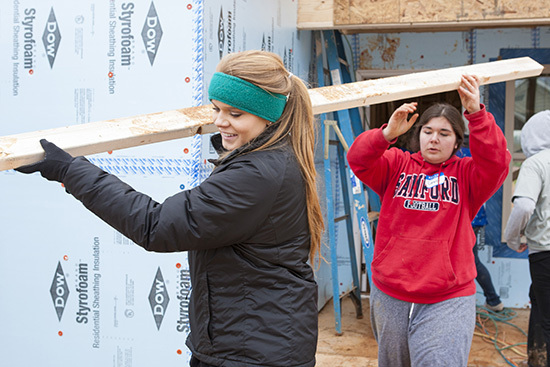 Samford’s build date is Saturday, Dec. 6 from 7:30 a.m. to 4 p.m. Anyone in the Samford community can participate in the build day, according to Molly McGuire, Samford’s director of alumni programs. McGuire coordinates alumni and employee participation. Student participation is coordinated by senior David Osula. McGuire encouraged volunteers to register in advance to participate. Volunteers can sign up for all day or either a morning or afternoon shift. Sodexo, Samford’s food service vendor, is providing lunch for volunteers. This year, a home will be built for Niki Mathews and her six-year-old daughter Lee’Anya. Niki works at Alabama Telco Credit Union as a sales development representative, while Lee’Anya attends kindergarten at Riverchase Elementary School. The build site is at 4433 Winchester Hills Way in northeast Jefferson County. The project groundbreaking is Dec. 3, and the dedication and hopeful completion will be Dec. 17. Samford is the only corporate sponsor, other than ABC 33/40, to participate in “Home for the Holidays” every year since its inception. Samford has a long history of supporting Habitat for Humanity because the missions of the two organizations are so closely aligned, McGuire said.